When you engage KKC, you will immediately understand how our extremely knowledgeable professionals, positioned at every corner of our company, can have a positive impact on your bottom line. Combined, our executives have more than 100 year’s industry experience. KKC’s technical staff averages 20 years of experience each. Our laser focus is centered on our client’s business processes and methods to improve their work flows, print efficiencies, and overall information sharing. 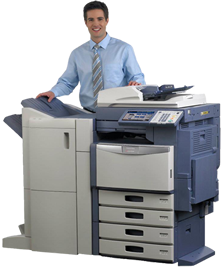 Whether your needs range from a new Multifunctional Product (color or black and white), HP printer service or supplies, Production rated equipment, Management of your printer fleet under a cost per impression agreement, National / Major Accounts, Workflow Design, Document Management Software, or even in house facility employees, we can make the difference you have been looking for. Call KKC and understand why we have been satisfying our customers for over 25 years.